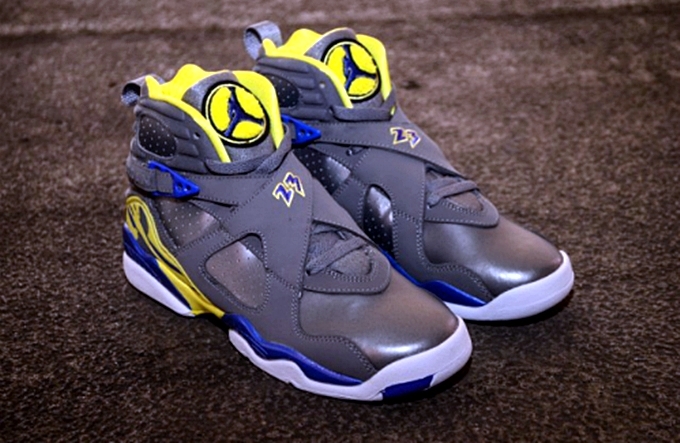 Before its hits the market in the highly-anticipated “Bugs Bunny” edition, a new colorway of the Air Jordan 8 Retro was added by Jordan Brand in its April 2013 shoe lineup. The retro edition of the eighth Air Jordan shoe will be released in Cool Grey/Violet Force-Electric Yellow colorway, which is dubbed as the “Laney” edition of the shoe. Cool grey leather dominates the kick and was accented with several electric yellow-colored areas such as the tongue, inner lining, the midsole, and the outsole. It will hit shelves this Saturday, April 13, and will be available at a retail price of $115. This one definitely looks cool so get it if you want a fresh-looking kick this summer.